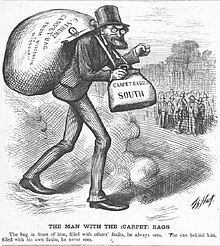 Carpetbagger is a term from the United States political history. A carpetbagger was a northerner who moved to the South after the American Civil War. This period is called the "reconstruction era". Carpetbaggers generally supported measures aimed at democratizing and modernizing the South – civil rights legislation, aid to economic development, the establishment of public school systems. "Carpetbagger" referred to the cheap carpet bags (a form of luggage) which many of the newcomers carried. The term came to be associated with opportunism and exploitation by outsiders. It is used today for a "parachute candidate": a political candidate for public office in an area far from home. ↑ Davidson et al 2002. Nation of Nations: a concise narrative of the American republic. 3rd ed, New York: McGraw Hill. ↑ Foner, Eric 1988. Reconstruction: America's unfinished revolution 1863-1877. p 296. This page was last changed on 29 September 2017, at 23:23.